NBC 6's Trina Robinson reports on the manhunt related to the woman who allegedly killed her husband and a Florida woman to steal her identity. Newly released surveillance video shows a woman in a Florida bar smiling and talking with a fellow patron whom police say she later killed so she could steal her identity. 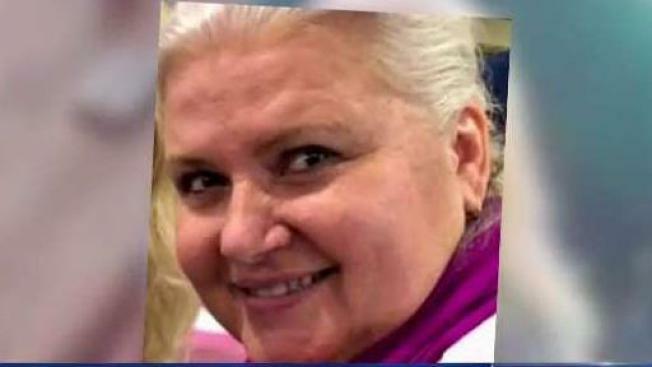 "She smiles and looks like anyone's mother or grandmother, yet she is calculating, she's targeted and she's a cold-blooded killer," said Lee County Undersheriff Carmine Marceno. Police say Riess is also wanted for the March slaying of husband David Riess in Minnesota. Authorities say she may have targeted Hutchinson because the two women looked alike. Riess is believed to be driving Hutchinson's car, a white Acura TL with Florida license plate Y37TAA. The car has been seen in Louisiana and Corpus Christi, Texas, since Hutchinson died. Riess' 2005 white Cadillac Escalade was found abandoned in a Florida park. Riess is wanted in Florida for murder, grand theft of a motor vehicle and grand theft and criminal use of personal identification. Her current whereabouts are unknown. "Riess's mode of operation is to befriend women who resemble her and steal their identity," Marceno said. "U.S. Marshals are actively involved in a national search for this dangerous fugitive. Riess is considered armed and dangerous and should not be approached if located."